So it was May Bank Holiday, and the first show of the year – The New Forest Spring Fair 2015! We rushed in to action, sleepy fuzzy friends did their bit, enjoying the attention and fuss, as they were stroked, petted and loved, then it was ready for the racing! Nervous and untested voices were brought to the fore, as Mark gallantly leapt in to the fray as MC, regaling and astounding the onlookers with facts and flair! Then the PA battery went dead! A short interlude as the battery was changed, and the ferrets were up and running, frenzied betting ensued and it set the theme for the day ahead! So after a successful first day, we returned on the Monday with heads and hopes high, and the sun came out! The warm rays of light and hope descended on everyone, the fair filled up, and everyone once again flocked to the dancing sheep (good pun there!) 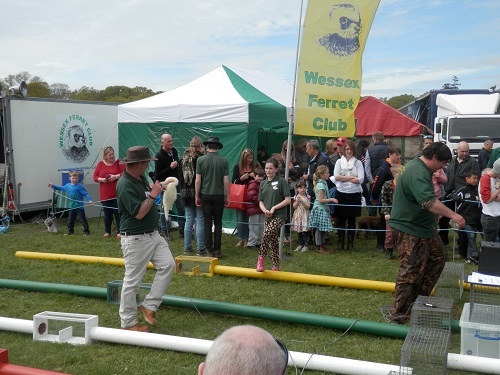 and the ferrets, the beer tent was a mere side attraction! After the endeavours of the previous day, our MC had a slightly croaky voice, and so helpful backup was provided by the other members of the club, who stepped into the breach and entertained the audience, each in their own unique way, some madder than the others, but all to great applause and cheers from the crowd. It was a great show, setting us up for the rest of the years with renewed confidence, and dare we say it, we were even more popular than the dancing sheep!